East Fife slipped out of the Scottish Cup at the hands of Brora Rangers. East Fife passed up a terrific chance to reach the last 16 of the Scottish Cup as they were dumped out by Brora Rangers. 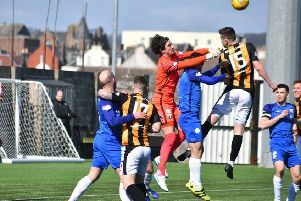 Sixth place in League One faced seventh in the Highland League and while it was never going to be a stroll in the park, East Fife should have had enough in hand to see off their visitors. Brora had beaten Stranraer in the previous round and were yet to concede a goal in the competition, so there should have been no threat of the Methil men taking the win for granted. But from the first whistle it was clear something was amiss, with the Highland League side the first to settle and impose themselves on the game. It should have been the other way around, the League One club taking it to their visitors and stamping their authority and superior quality all over it. They simply failed to do that, and allowed Brora to stroke the ball around at will. When the Fifers did win it back, too often passes were misplaced or the visitors were swift to close down. Brora deserved their goal when it arrived but the manner of it had the Fife fans ripping their hair out in frustration. From Gavin Morrison's corner Colin Williamson couldn't believe his luck as he was allowed to head home unmarked from six yards. It was yet another goal lost from a set-piece this season and cost the side a place in the last 16 and a potential money spinning tie. Something needed to change at the break and it did. Kieran Millar was hooked with Craig Thomson handed his debut after signing on Saturday morning. The former St Johnstone winger, who grew up a stone's throw away from Bayview, added a lot more urgency to the side. It was Brora's turn to soak up some pressure as East Fife went on to enjoy their best spell of the game. Chris Duggan should have done better from close range with Scott Linton also going close with a free-kick which clipped the outside of the post. But it wasn't to be, and the side slipped out of the cup with a whimper while the Brora fans deservedly celebrated with their players when the full time whistle went. Boss Darren Young said: “It’s not a good feeling and no disrespect to Brora but we’re a League One side and should be beating them. “But on the day they got the performance and did it. “They did well - we never. “They took their chance - we never. “We gave the boys enough information on Brora but it comes down to one man not picking up and allowing a free header at a corner. East Fife - Goodfellow, Dunsmore, Kane, Page, Lamont (Wilson 81), Slattery, Duggan, Smith, Wilkie, Millar (Thomson 46), Linton. Subs - Cordedry, Watson, Mutch, Willis. Brora Rangers - Malin, John Pickles, MacDonald, Williamson (Ross 81), Duff, Morrison, Maclean, Graham, Sutherland (Campbell 83), Mackay (James Pickles 75), Nicolson. Subs - Hoban, Macleod, Lisle, Brindle.